Very powerful but demands a lot of prep on the part of the user, Base could well be the ultimate blank MIDI control canvas. Unrivalled customisation. Great build quality. Excellent Live template. Fantastic pads. Compact size and USB-powered. Requires patience and willingness to program. It's only over the last decade or so that hardware MIDI controllers have become ubiquitous in the computer-based music studio. A generation brought up on twiddling virtual knobs have discovered the magic of getting their hands on the real physical thing. Now, with controllers out there to suit every major piece of music software, and the likes of Ableton and Native Instruments offering superb bespoke hardware units designed specifically for their applications, is there room for another jack of all trades? Livid Instruments certainly think so. "Base is comprised entirely of touch-sensitive pads and buttons, and has touchstrips instead of sliders"
An 8x4 matrix of velocity-sensitive pads take centre stage, each with its own RGB LED backlight. The pads feel fantastic, offer true polyphonic aftertouch and are at least the match of those experienced in any other pad controller we've come across. 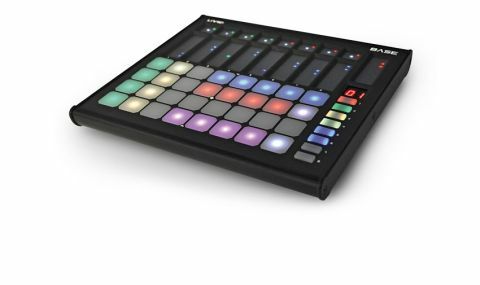 They can be used as drum pads, pitched 'keys', clip triggers for Live, mute/solo buttons - anything you like, really, as every control on Base is entirely customisable. You can even set different buttons (or presets) to transmit on different MIDI channels, enabling simultaneous targeted control of multiple applications or multitimbral instruments. Base also features nine touchstrip sliders with LED value indicator strips and touch-sensitive buttons at the top of eight of them. These can all be MIDI-assigned to whatever you want, depending on what you're using them with. With a synth, for example, they might be assigned to cutoff, resonance, LFO rate and depth; with your DAW they can serve as channel faders, pans, sends and so on. "The sliders can also output note and velocity data so you can find whole new ways to use them to play and control your music software"
We had a lot of fun using Base to control Sugar Bytes' Turnado multieffects plugin, with each slider assigned to one of the eight effects dials. And as the sliders can also output note and velocity data, with various customisable LED settings and modes on offer, you can find whole new ways to use them to play and control your music software. You can even use them to scroll through tracks in your DJ software. We can imagine some people being reluctant to sacrifice knobs for touch strips, and we'll admit that it does take a little adjustment. In an age of touch-screen phones and tablets, though, we all have more than enough digital dexterity to cope. Within a day or so, we found ourselves fully accustomed to the idea, both physically and conceptually. Finally, there are eight function buttons, also with RGB backlighting. These too can be customised and used to access presets, change setups, trigger Live scenes, control your DAW's transport... The list goes on. So, how would you get started using a controller as open-ended as Base? Well, the Livid site offers a Live template that gives plenty of food for thought: the function buttons give access to a range of control setups - one for playing notes (with a grid layout similar to Push, making complex chord patterns easy to play, even for beginners), another for drum pads, another for clip launching and another for mixing. It is quite similar in this respect to Novation's Launchpad, but without the Auto Map middle-man and with far more control. And, of course, Launchpad doesn't have any sliders. Speaking of Ableton Push, there wouldn't be anything to stop you setting Base up so that different presets trigger different in-key modes, à la Push, with all the notes outside the given scale deactivated. We haven't yet addressed one of Base's coolest customisation features: colour-coding. When using Base to control multiple applications or DAW functions, you can assign the pads to all switch to a different colour set for each one, so you know at a glance whether you're mixing, playing, launching, controlling effects or modulating synths. Or you can have one half of the controller assigned to one program and the other to another, with the pads for each side coloured accordingly. Finally, we must mention Base's compact, tough construction and slim profile. It isn't light, but the build quality makes every ounce count. Ultimately, Base has been made by geeks for geeks, but that shouldn't deter the rest of us - right out of the box, it's ready for use as a basic MIDI instrument/controller. Still, at this price, if you don't like programming your own templates, never play live and/or only need quick, basic controller functionality, then it's probably not for you. If, however, you want to be able to control multiple applications with one incredibly customisable controller, like the idea of hot-switching from controlling DAW to synth to effects plugin during a live performance - or even all three simultaneously - then we know of no better option.